In Beatrice Prior's dystopian Chicago, society is divided into five factions, each dedicated to the cultivation of a particular virtue—Candor(the honest), Abnegation (the selfless), Dauntless (the brave), Amity (the peaceful), and Erudite (the intelligent). On an appointed day of every year, all sixteen-year-olds must select the faction to which they will devote the rest of their lives. For Beatrice, the decision is between staying with her family and being who she really is—she can't have both. So she makes a choice that surprises everyone, including herself. During the highly competitive initiation that follows, Beatrice renames herself Tris and struggles to determine who her friends really are—and where, exactly, a romance with a sometimes fascinating, sometimes infuriating boy fits into the life she's chosen. But Tris also has a secret, one she's kept hidden from everyone because she's been warned it can mean death. And as she discovers a growing conflict that threatens to unravel her seemingly perfect society, she also learns that her secret might help her save those she loves… or it might destroy her. 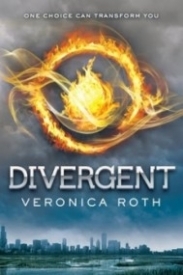 Divergent catapults the reader into future where society has taken a dramatic shift. The reader is thrust into the dystopian future of Chicago, Illinois. Veronica Roth keeps the reader spellbound from the very first chapter. Each page increases the anticipation to find out what will happen next. In this dystopian future, Beatrice Prior is sixteen years old and the time has come for her to choose her faction, her future. Her family belongs to Abnegation, a selfless faction, that serves as the city governing force. Throughout her childhood, Beatrice never felt that she belonged. But leaving her faction means she can't see her family anymore. Once she finally decides which faction is for her, nobody thinks she is capable. Breatice, has to prove to everyone that she's strong and capable of anything. But there is one thing she can't tell or show anyone. Beatrice has a secret, a very dangerous secret. If the leaders of the factions discover what she is hiding; it could cost her her life. Divergent is a thrill ride you never want to stop. I read this book in two days. I just couldn't put it down. I know I found myself deeply invested in the characters and Veronica Roth's plot twists kept me on the edge of my seat. My only reservation is that the book, while handling very important themes, has a few graphic and mature scenes. Although I believe these scenes are necessary for plot, character, and theme development, Divergent may not be for younger readers. I would recommend this book for mature readers 13 and older. Suspense-Keeps you on the edge of your seat. A book you can't put down. First, let's start with the characters. I cared for each and everyone of Ms. Roth's characters. That is not to say that I wanted good things for them, but I cared. I cared about what happened to them, I cared about what they said, where they went and how they acted. That is unusual in a book, at least for me. All of the characters hold a place in my heart, even the 'evil' ones. I just want to hit a few of the main characters because they deserve the extra attention. Beatrice/Tris; What a strong role model for girls everywhere. She loves her family, but has to be true to herself as well. She makes a tough decision and then when things get tough, she sticks behind her decision. She doesn't give up. I honestly felt like I could feel what she was feeling. Four; He had me captivated from the first page he was on. He is myserious (I mean, come on, his name is Four), tough, but there is also a soft part of him that comes out and I wanted more. I really enjoyed reading about his weaknesses and how vunerable he is. Eric; With every story there has to be some sort of antagonist. Someone we love to hate. Eric is that person. He is ruthless, evil, mean to the core, has no sympathy and you never know what he is going to do. Even though I despised Eric, his character was so well written and I could not wait to find out what he was going to do next. Second, the story. I was hooked from page 1. I was horrified at what Beatrice had to go through in order to become a true member of her faction. I cannot imagine having to make that sort of choice when only sixteen. Ms. Roth writes so well, I could really "see" this futuristic Chicago. With great action, heart breaking scenes, loving moments and edge of your seat writing, this is one of my favorite stories of the year by far. This book kept me on the edge of my seat the entire time. Beatrice is a giving, strong character, she is a great role model. The characters have lots of depth and I cared for all of them. Divergent is one of my favourite books of all time. The story is about a girl named Tris who must choose where she belongs in her society but she finds this difficult because she is conflicted between the safe option of returning to her comfort zone but never being truly happy or taking a huge risk. The best thing is that this is only the beginning of the story. As the story goes on, we see the perfect balance of action, humour and romance. It hooked me in from the first page. Tris is such a strong female lead who is bold and brave and puts others before herself. She never gives up on her goal even though at first it look close to impossible. We get to see her other sides as well showing she is not just a one-dimensional character. The fact that the story is written from her point of view is also an excellent decision by Veronica Roth because I felt what Tris felt also. The other characters are well-written. Four is mysterious and hooks you in as you want to know more about him. We also get to see his more gentle side which was very enjoyable to read. Tris’ friends Christina, Will and Christina show us that no matter what your background is, you can still get to like one another and have common interests. It also shows us how different people deal with pressure and seeing your friends succeed even though you might not be. The antagonists make you want to hate them with a passion while also wanting to find out more about them and how they turned out the way they did. Even at times, you could find yourself agreeing with some of the things they said even though they had evil agendas. Tris has an extremely dangerous secret that she has to keep and t the twists and turns of the story have you on the edge of your seat, rooting for Tris. Overall, I would most definitely recommend this book, it’s a must-read for dystopian lovers! All the characters have depth and are somewhat relatable. The plot is captivating and hooked me in straight away. Tris is such a strong, bold character. Trust me- it is NOT a Hunger Games rip-off. In this dystopian world sixteen-year-old Beatrice Prior, Tris, must find where she fits into society. However, when she fails to fit into a category during the aptitude test, Tris must find a way to survive and keep her secret; Tris is Divergent. This society has five different factions; Amity for peace, Abnegation for selflessness, Dauntless for brave, Candor for truth and Erudite for intelligence. The Divergent don't fit into any one faction, because of this they are being hunted and killed by those this power. The exposure of Divergence leads Tris' world into rebellion and discovery. Soon she is in places and doing things she never could have imagined. Throughout all these trials and struggles Tris finally finds herself and discovers loved ones along the way. Tris is a strong character. You really learn about how she thinks and what length she is willing to go to in order to do what she believes is right. She transfers from Abnegation, dubbed 'The Stiffs' by every other faction, into the tough and dangerous faction of Dauntless. There she meets her love interest Four. Though Tris is small she learns how to use that to her advantage during her training, slowly becoming one of the best new members. I really love Tris. I find she is a character you can relate to, with normal insecurities and worries in a dystopian world so different to our own. This series really explores the difference in personality and how we all fit into society. It really makes you stop and think about who you are, what makes you special and where you 'fit'. A great series, I really enjoyed these books. However, I must say I loved the first book best. I really enjoyed Divergent. It was unlike anything I've read before. Tris is a super strong and brave 16 year old girl who has to adapt to a different lifestyle after transferring from Abnegation (selfless) to Dauntless (brave) in a dystopian version of Chicago that is divided into factions. I loved all the action and stunts the Dauntless do and the chemistry between Tris and Four. There was also quite a bit of violence, death, brutality and some cruel characters but nonetheless it was still a captivating read! I would recommend this novel to anyone who is looking for something that will keep you on the edge of your seat and up all night! I can't really remember why I picked up this book to be honest with you, I think because it was just one of those books that was floating around out there and it was talk of the YA community. Now three stars means I liked this book. Liked it enough to binge read it, and then binge read the second as well, before discovering I was stranded in Rome with no wifi connection and without the third book on my Kobo. THE HORROR. I do have to say I don't like that people think that every dystopian novel is trying to rip off the hunger games. The Hunger Games trilogy was great, but certainly not the first successful dystopian story, maybe just the first successful one of our generation. This book was about a girl (Tris) and her journey into discovering herself and fighting to become who she wants to be (and hiding the secret of what she truly is). I think the point of this story is to help us to find ourselves. To see that we are beyond our labels, no one is any 'one' thing. Not to quote the breakfast club or anything but....well, I'm gonna quote the breakfast club. "You see us as you want to see us - in the simplest terms, in the most convenient definitions. But what we found out is that each one of us is a brain...and an athlete...and a basket case....a princess...and a criminal." This is essentially the concept of the Divergents. These people who have a bit of everything, are a threat to a perfectly labeled society, because without labels they have nothing but chaos. Story: So over all I enjoyed the story. The action, fight and death scenes were very vivid and well written. What I did have a bit of trouble with was the romance. Don't get me wrong, if I had a Four & Tris 4ever shirt I would proudly wear it, but I think there was something inbetween that was missing. Once they are together they have this great connection and understanding of one another. However, the lead up to this all just seems very abrupt. He is her superior in a sense so there is somewhat of a moral dilemma, and it seemed like the main focus of the story was on the fighting and glosses over the fact that they just suddenly boom, are together and are soul mates. I feel like this story wrecks with your emotions in a lot of ways. You never know who you can trust and that's part of the reason I like it. However it is sort of a glimpse into a world of 'what happens when teenagers are in charge' Because seriously, Eric and Four are both eighteen and they are essentially leaders in their faction. What do we do for training? Neurologically damaging laser tag, and zip lining. HECK YEAH. It sounds like a lot of fun (you know except for being zapped in the training game). WHERE ARE THE ADULTS. Is my question, even Dauntless adults have to have some sort of concern over their children's well-being, no? One Choice, decided your friends. One Choice, defines your beliefs. One Choice, determines your loyalties - Forever. ONCE CHOICE CAN TRANSFORM YOU"
This book has honestly been on my bookshelf for a year now, and I always said I would get around to reading it. But I ended up buying the movie the day it came out and also said "I'm not watching it till I have read the book." So if you follow, I've had the movie almost a year as well. Apparently, no one is as patient as I am when it comes to this stuff. I can't tell you how many people have got tired of waiting and just spilled spoilers after spoilers. So I had to break down and finally read it. Now on to my review. There were a few times I had to put the book down and step back to calm down from the emotion overload...and then I had to stop myself from running all around the house fangirling. I know a lot of people say this book is just a Hunger Games rip off... I don't see it. Which truth be told, if one book is like another book, I am real fast to call it out. But I didn't see that in these books. I can see how people MIGHT compare the two by saying the government is ruling everything and a girl has to pretty much save the day.. But I still don't agree they are anything a like. Truth be told, if you love The Hunger GamesI would actually recommend Divergent to you. I kid you not, I finished this book at 12am this morning and I wanted (so bad) to hop in the car to get the second book from the store. I can't wait till I get the second book and am able to read it. I'm sure I'll add more to this review later over time, but right now, I'm still stuck in the "Oh my freakin gah! That was amazing!!" mind frame. My friends recommend this book. I,personally, didn't like this book all that much. I think the movie was better than the book. It didn't get slow,but I've just,read better. I really enjoyed the world building in this book it was new and very well put together.the story line in this book was just all around amazing but I feel that books 2-4 ruined the whole series. I almost wish this was just a book by itself.Anyways this book I really enjoyed, tris and Tobias were great characters. I really enjoyed this action-packed novel. This book is one of the best futuristic novels I have ever read. I enjoyed hoy Roth could describe the characters and make them so real. When I read The Hunger Games I thought it was confusing, but I understood this novel completely. I give this book 5/5 stars. Thanks to the first-person (heroine only) present-tense telling--along with the general kids-fighting-to-survive dystopian premise--the Hunger Games influences felt strong throughout...with a dash of 'Inception' for plot spice. Despite the page count, this was a quick read. The present-tense of course lent itself to immediacy, so the pacing clipped along at a steady rate even through more mundane scenes. The prose was effective, clean, and simplistic. So much so, this reader often had the sense that the story might be geared for more of a younger YA to middle-grade range. But the level of brutality and sensuality was beyond that of what most would recommend for MG. I was initially encouraged by the personality/faction-based society laid out by Roth: Abnegation, Amity, Erudite, Candor, and Dauntless. Break out a thesaurus and you'll have a clear enough idea about the identity characteristics and ideals of each. (And just in case you get confused, there's a handy glossary and manifesto listing in the back of the book to help you out.) Readers receive the vague sense that the previous world was destroyed by “war” and that a number of the post-war factions are tense with each other. The story takes place in some deteriorated version of Chicago, and secrets are the name of the game. So many secrets...it sometimes feels as though they impede the worldbuilding. Beatrice (Tris) rapidly transitioned from oppressed, inexperienced little girl to confident [email protected] A little too rapidly for this reader to suspend disbelief. While Tris' thoughts were logical and easy to follow, I maintained only a tenuous connection to her. In talking to more people who've read the book, I have to conclude that this is more of a personality thing. (I have developed the theory that she particularly appeals to smaller females who've struggled with a sense of impotency, repression, and helplessness. As a more physically powerful and innately aggressive sort, I had more trouble relating to her than I did with, say, Katniss Everdeen.) I also didn't really note the passive offering of useful survivalist information that might lend such a story more weight and lasting value. Add to this the semi two-dimensional side characters/villains and limited depth to Tris' family members...and the result is the character motives and emotional relatability being a bit less pronounced than other comparable books of this genre. The major flip side to this was Tobias. We weren't in his POV, but I understood him. He wasn't sweet, smooth, or particularly gentle, but he wasn't bad-boy typical, either. There are some fairly obvious things in the book. Little things mentioned at the beginning that are built on later on. Let me tell you this, nothing is coincidence. The story gets better and more intricate with every page. I gobbled it up in just about one sitting. It's a book of choices and not being confined to one lifestyle. While it's a book purely for entertainment, it seems to have some moral things in there as well.